Nose: Peach, pear, Golden Delicious apples, paper white narcissus. On the palate: Crisp and medium dry. More Golden Delicious, stone, apricot, smoke. Finish: Fairly dry. White grapefruit, smoke, a lingering background sweetness. Parting words: I’m a big fan of Alsatian Pinot Gris, and I’ve had some good Michigan ones too, so I was eager to get into this bottle. It did not disappoint. It has a great balance of varietal character with some citrus notes, but they are well in check by smoke and minerality. This is firmly in the Alsatian, not Italian, style of making wine with this grape. It’s very food friendly (buttery fish or light vegetarian fare work best) and is affordable for a wine of this quality. 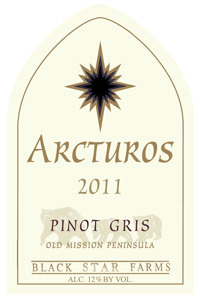 The 2011 Arcturos Pinot Gris is recommended. Nice. Looking very much forward to trying this one. I am with you on Alsatian style (which is similar to most German Pinot gris and blanc, much more fruity than the Italians).